AND search: If you enter more than one search term in the search box, your search will retrieve results that contain all those terms. For example, enter ‘Iraq Iran', to find all object records containing both ‘Iraq' and ‘Iran'. OR search: If you want to search for either one term or another, enter your search terms separated by ‘or'. For example, enter ‘Japan or China' to find all object records containing either Japan or China. Enter your term followed by an asterisk (*). For example, entering ‘Islam*' would return results for all records containing words beginning with ‘Islam', such as ‘Islam', ‘Islamic', and ‘Islamabad'. For example, searching for ‘India' is the same as searching for ‘india'. Enter your term within double quotation marks (""). For example, to search for the term Abbasid period, enter "Abbasid period". Enter the term you want to search for, then a minus or subtraction sign, followed by the term you wish to exclude from your search. For example, if you want to search for records with the term ‘stoneware' but exclude records with the term ‘green', enter ‘stoneware -green'. It is possible to search using non-Latin alphabets. We do not currently translate all information into other languages. Mu Guiying is a military heroine from Northern Song dynasty folklore, whose story belongs to the series General Yang’s Clan. In this story, Mu marries a third-generation descendant of General Yang’s family, and serves as a major general in the battles against Northern Song’s neighbours Liao and Xixia. The story General Mu Guiying was adapted in 1959 into Beijing opera to celebrate the People’s Republic’s 10th anniversary. 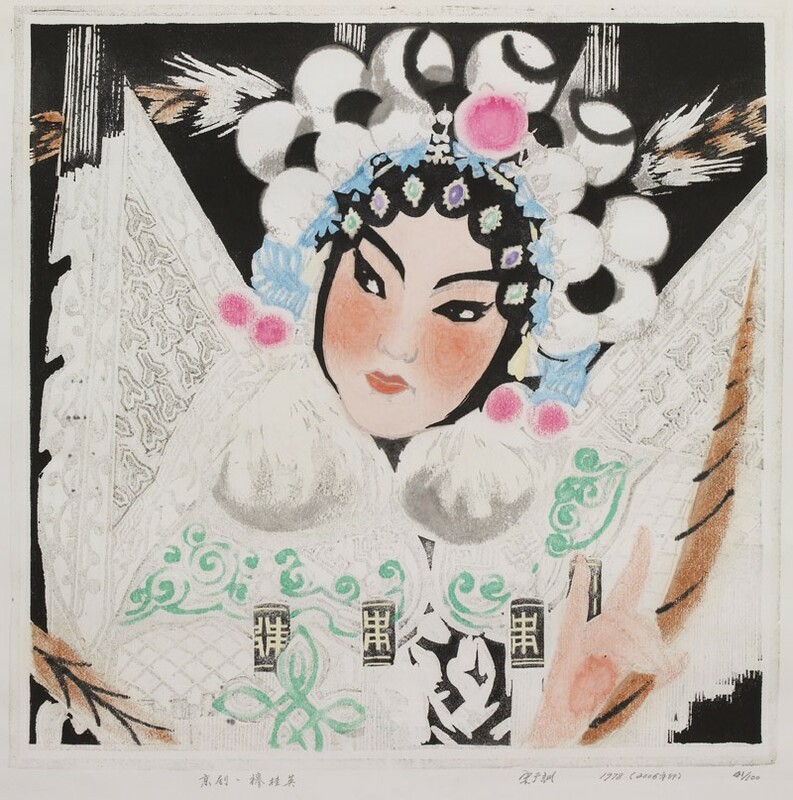 The heroine was played by the famous actor Mei Lanfang, who was possibly the inspiration for this woodcut image. The use of water-soluble ink here is reminiscent of traditional New Year Pictures. I like water-soluble ink printing techniques, not only because they embody a national characteristic, but also they require the properties of cutting tool, wood, and charm. There is not other printing technique that can create the effect of water infusing into ink. Song Guangxun first studied art at the National Peking Art School in 1947. After graduating from the Painting Department of the Central Academy of Fine Arts in Beijing in 1951, he was appointed as editor of Xinhua Daily and Dazhong Pictorial in Chongqing. He has dedicated many years of his life to the Sichuan Artists’ Association as a professional printmaker. Most of Song’s early work adapted the socialist realist themes that predominated in Chinese art during the 1960s and 1970s. 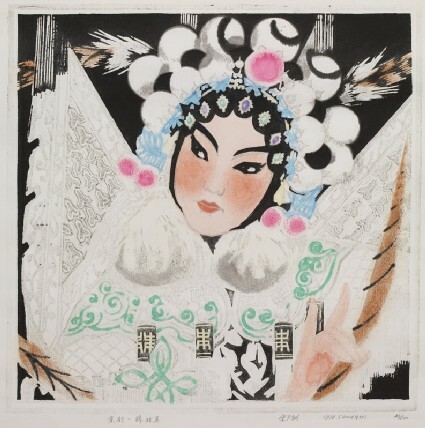 Since the late 1970s, most of his woodcuts are printed with water-soluble ink techniques and are more concerned with traditional Chinese aesthetics.